So all you need to do, is simply choose the option you'd like from the pull-down menu. The price of the item will automagically update so you know exactly what you're paying before you checkout. No nasty surprises, and more options for you, so you get exactly what you want. 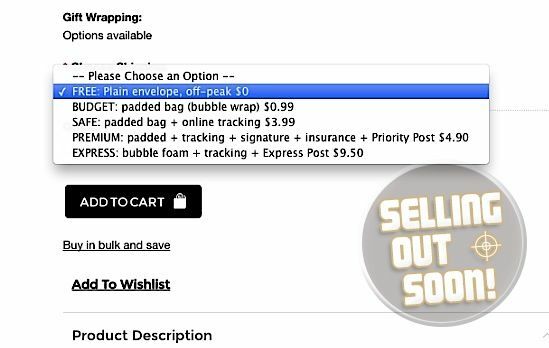 You may also add some packaging options from within the shopping cart (click Gift Wrapping to add options such as extra foam, triple bubblewrap protection etc) which is useful for collectors, if you're buying a gift, or if you really want to make sure that items arrive to you in the most perfect condition. If you have a coupon code, you can add it in your cart, and exactly how to do this is covered in our next blog post!